EVERY EXPLORER I HAVE SEEN HAS THE SAME EXACT ISSUE! after 4 years living with the cracks, a rear end accident forced entire door to be replaced. I thought problem was solved. 6 months later, it cracked again. It now has 3 cracks. The panel is now taped on to hopefully stop panel from falling off. It looks terrible and will certainly influence selling or trade-in.I am in Fl., and 98% are craked. Can't believe Ford can get away without solving the problem. Ford has refused to fix it. I have contacted Ford about this problem and I was told they had no complaints. Just about all the 04 Explorers I have seen have the same problem. Ford needs to take care of this as good customer relations. They must have had many complaints about this problem. From 05 on the gate design has been changed. FORD ... ARE YOU LISTENING ...??????? 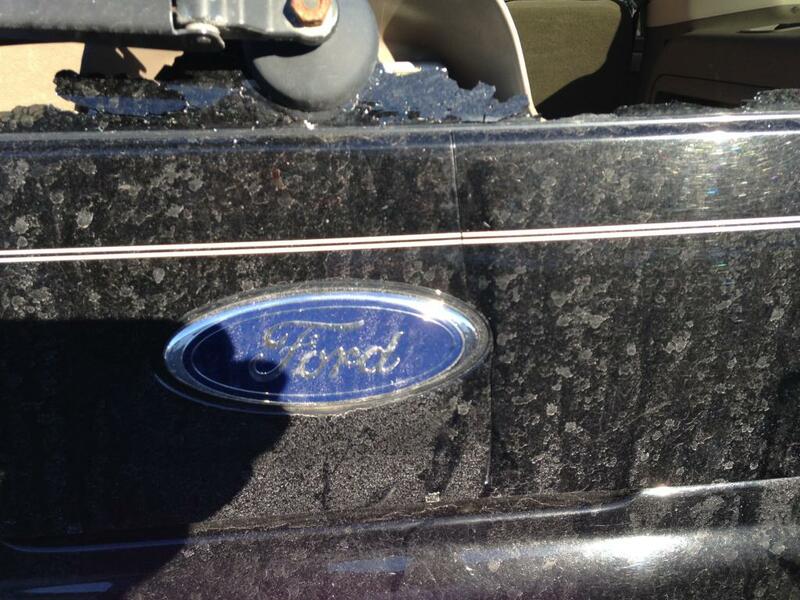 My Explorer has the crack on the rear hatch just right of the Ford logo, which appears to be a VERY common flaw. Ford needs to make this right! So when is Ford going to make good on this. I asked at my mechanic shop and they tell me they have a couple of customers who had their glass shatter after reporting the rear trim plate had cracked. I think that once the trim cracked it causes some stress on the glass and can make glass explode. I am concerned that it could happen to me. No one seems to offer a fix except to replace panel. It looks like the panel is glued to glass underneath and this would take a special procedure to remove it. Can't seem to get any answers. The dealer tells me it will cost about $500.00 to replace and will not cover it under any type of recall or warranty. When is Ford going to live up to their defect and issue a recall? I have owned 3 Explorers all from new and This is the first I've seen this happen. Will think twice before buying a new one this year. It seemed like my panel cracked because of the cold since it was just there when I woke up one morning. Every Explorer of the same vintage that I see on the road has the same crack. Ford wants owners to be loyal, yet they let this widespread problem go unresolved. Well, on January 19, 2016, I joined the thousands of explorer owners who have had their rear hatch panel crack from bottom of rear window, to bottom of panel. I have a 2004 with just 96k miles! Nope, it's not freeze related, so don't believe that crap. I'm in Wa, and there was no freeze. No it isn't the wiper motor, as some have claimed. In the morning it wasn't there(45 degrees), and in the midday(50 degrees) it was cracked. I believe it's a material fatigue. Why didn't jerks at ford just use aluminum or some other metal instead of some stupid hybrid formula. Considering all the use a hatch panel gets, you'd think someone would have a brain, but apparently collectively, they didnt. I researched the class action suit going on, and it's a joke. ford managed to get the critical fix part of suit dismissed, so I doubt we'll get jack. I also did research on the fix. The only one out there worth anything is a plastic after market panel. To get it all done is still over $200ish for panel, install, and painting. not sure I will do it, but will wait until summer when weather dry and sunny. I haven't heard or read anything that guarantees the replacement will be crack free for life. If I had known the problem spanned 4 years of models, I wouldn't have bought it. A friend of mine owns a 2003, and his crack is far worse, and he never got it fixed. In 2004, or so, ford changed materials, but found it still cracked, and still no recall. I believe that since it's a body defect, ford should step up and pay for the replacement panels, and installs. Part of me wants to join other thousands and leave the crack for all to see. Would I buy another ford? well yes. And that's because other automakers are just as bad, and sometimes worse. A crack in a back panel wont kill us, unlike other problems with other vehicles. I got this explorer in 2008, but there wasn't enough on the internet to suggest I shouldn't buy it. Now there is. Time tells. When this vehicle croaks, if I don't first, I'm not sure at this point what I would get. It's rare to have honesty in manufacturing these days, so it's buyer beware for virtually everything. I bought my explorer used, and can say i'm really glad I did. Can you imagine outlaying a small fortune, and possibly still having payments and having this happen? sucky. When and if, I get the panel repaired, I will post the outcome. Oh, and before I forget, I got some silicon seal that stays flexible, as you really should seal any cracks anyway. Plus, I sealed the lower rubber of the window, just to be sure all would stay dry. There could be more problems if moisture gets to motor, or wiring, or whatever, so don't put it off. So far the clear flexible seal is working thru tons of rain. And, by the way, my friend who has a 2003; his crack went down the center and affected his locking the hatch. i'm fortunate as mine was to the right side of the ford logo(awful reminder), and so lock not affected. But, there's no guarantee another crack wont show up somewhere with material fatigue. That's what makes this whole problem with us owners, irritating. Ford should fix all their major complaints for everything!!! Purchased this car in 2004. Only 40,000 miles. Concerns me that this problem could get even worse. One day no crack, next day, large crack. 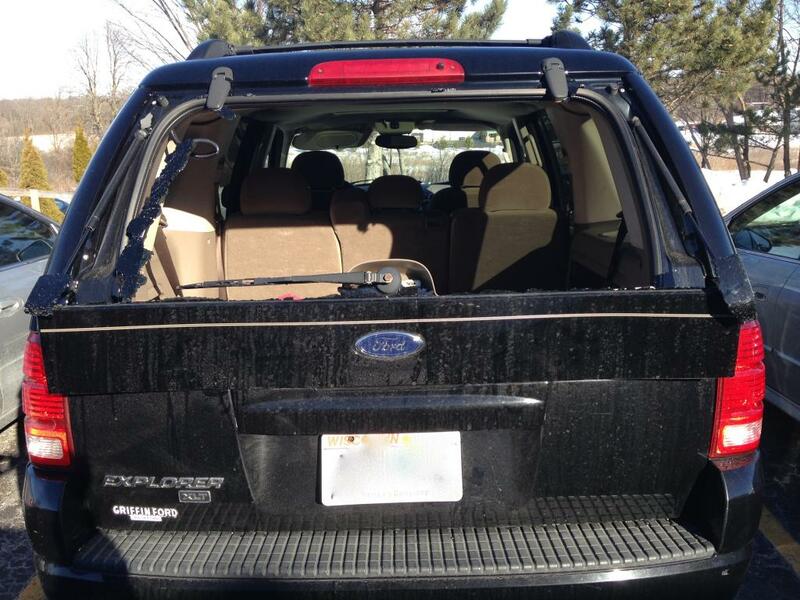 Ford should repair this problem, especially since I found out this is a problem with a LARGE amount of Explorers. This is THEIR oversight, and they should be responsible for the repair. I'm not asking for money, I'm asking for a repair due to Ford's negligence. What's right is right - and the right thing to do in this instance is for Ford to issue a repair for all damaged vehicles. 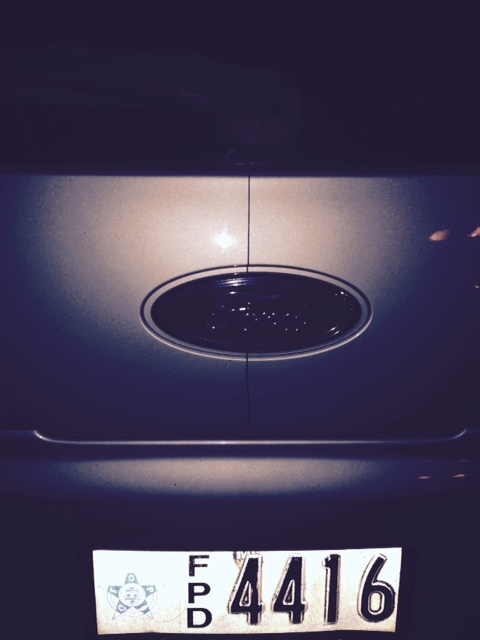 The crack in the rear panel appeared shortly after purchasing this Ford. I had contacted Ford who said there was nothing in their records of this being an issue! It was not how many Fords had the issue vs. how few did not. I actually had it fixed at my local Ford Dealer for $450.00. Thought the issue was put to rest, until I walked out and saw that the CRACK had REAPPERED. Repair lasted 2 years! Definately a design issue. I will never purchase another Ford. I was told by a dealer that this happens mostly during the winter months, water gets behind the panel, freezes, and then when you shut the window it causes it to break. Extremely disappointed to find a crack under the window on the rear lift gate. I have spent a lot of money keeping this car in good shape. Over the years I have replaced a lot of parts in the suspension, wheel bearings, rear differential bearing (fixing that wasn't cheap), peeling paint on the hood, shift indicator broke years ago, I could on and on. No more Explorers for me, bad move. Update from Jan 29, 2016: The cracked panel I wrote about now caused the heart window to spontaneously explode while I was parked at work. I called FORD and as I suspected it's not a recalled problem because according to them it's not a safety issue. Imagine this happening while I was driving down the road. It is absolutely insane that ford hasn't recalled this. I'm in my truck everyday all day for work. 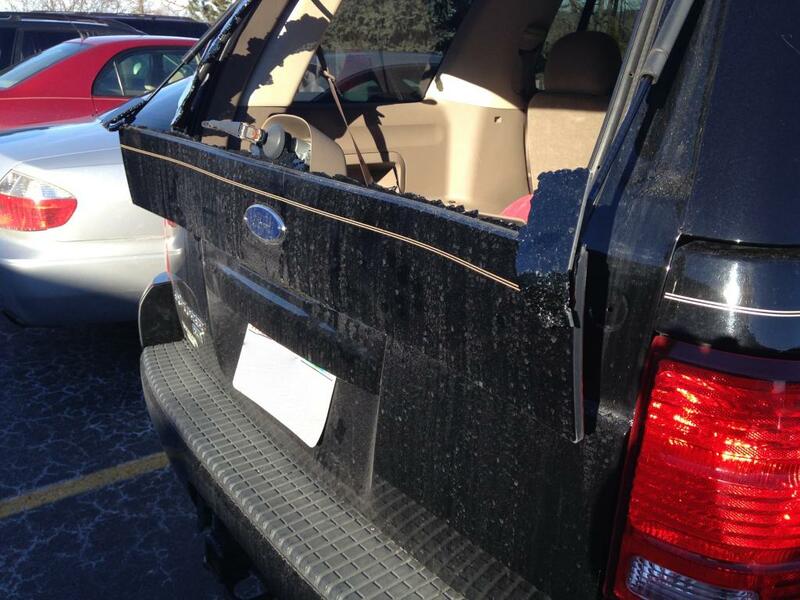 Every single Ford Explorer I see has the same cracked panel under their rear window. Ford company should not get away with this! In 2012 I noticed this annoying crack that went down through the center of the truck tailgate. I took the truck to Koons Ford body shop and they said that there wasn't a recall on the issue. The repair would cost a nice amount to repair. I have noticed a large number of Ford/Mercury SUV's with the crack down the center of the tailgate. Some almost in the same location. I feel that Ford/Mercury should repair the damage and apologize for deceiving people knowing that this damage is a factory defect. 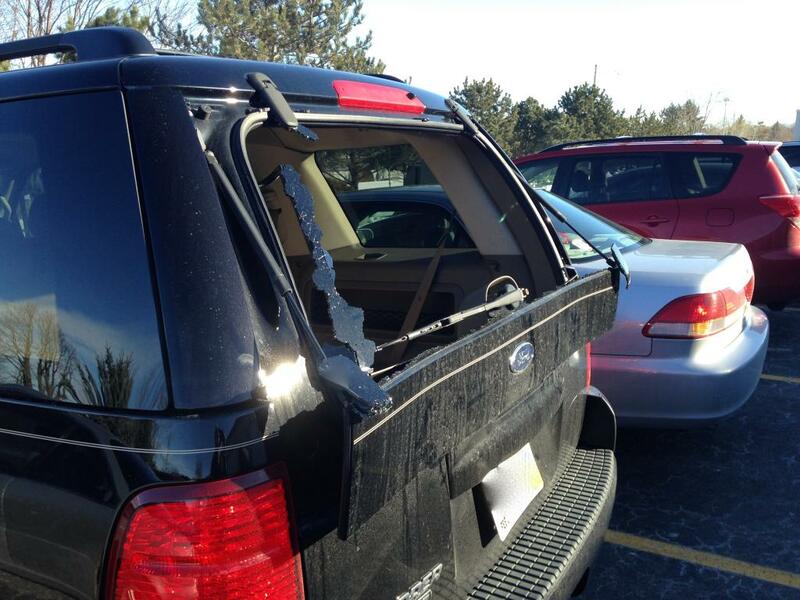 Rear panel cracked this past winter 2015. Went to Ford dealer which said, this happens a lot, but Ford will not fix this. It will most likely cost $500 or more to fix plus paint. Soon after the first crack and shortly after the vehicle passed the 36K miles original warranty, I visited a Ford dealership and was turned down on the repair indicating it was out of warranty. Why is there no recall for this issue? I see other vehicles with the same cracks on the rear panel. Seems like a class action suit is necessary.